Dealing with disability can be confusing, and very frustrating for people who have fallen victim to unfortunate events. However, Mark Klotzbuecher is passionate about fighting the insurance giants, and advocating for the injured or disabled. Mark excels at explaining the sometimes confusing legal process, and has a unique understanding of the mechanisms of injury. Mark began his career in the corporate world. He spent years working in management, before migrating to the law department of a Fortune 500 company where he drove compliance and anti-corruption efforts. During the course of his early career, Mark managed operations at numerous manufacturing sites throughout Minnesota and Wisconsin, oversaw a global network of investigations, and added value at every turn. When Mark joined Fields Law Firm, he brought with him a depth of knowledge and experience unique to disability law. Mark attended UW-Green Bay, where he studied Human Biology. He also made the Dean’s List, served as a teaching assistant, and was an officer in numerous campus organizations. He continued his education at Vermont Law School, where he earned a Juris Doctor, Masters of Environmental Law and Policy, and captained the rugby team. 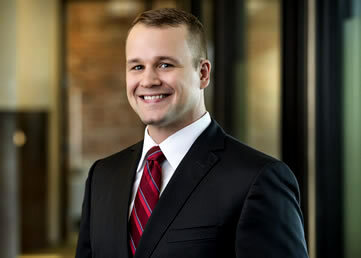 Mr. Klotzbuecher is admitted to practice in both Minnesota State courts and the U.S. District Court of Minnesota. He is a member of both the Minnesota State and Hennepin County Bar Associations. Mark has also served on the UW-Green Bay Alumni Association and the Volunteer Lawyer’s Network. Mark is a Minnesota native from the Twin Cities. In his free time, Mark keeps very active and can often be found hiking with his Great Dane. He also spends time weightlifting, running, cycling, and practicing several martial arts. Why Should I Hire Fields Law?